These Tourmaster Synergy gloves barely put out any heat, unlike the Tourmaster Synergy heated vest, which pumps out almost too much. In my opinion, the gloves are clumsy, they make my hands sweat, the gauntlets are strange and the wiring connectors get in the way. I really like the Tourmaster Synergy vest but, I’m sorry to say (and sorry to be so blunt about it), the matching Tourmaster Synergy gloves are a big let-down. Two of us have tried everything we can think of, and the gloves are functional, but we just don’t feel any heat, no matter the setting. 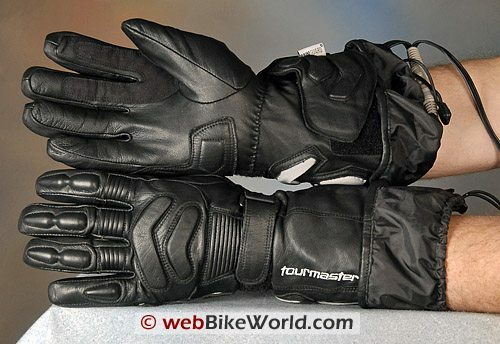 The gloves come with a waterproof controller and motorcycle wiring harness, and they also have the ability to connect to any other Tourmaster Synergy heated clothing item. 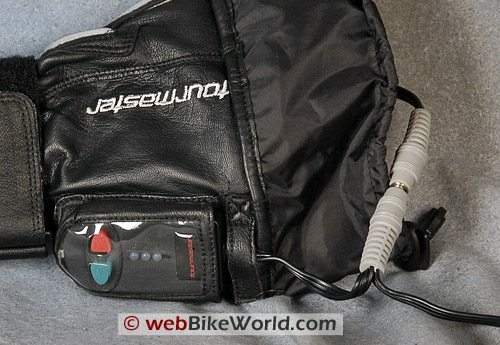 The wires for the gloves must be worked down the sleeves of the rider’s jacket, and each glove is plugged in to the harness. But the connectors are bulky and there’s no acceptable method that we’ve found to hide the big gray connectors under the gauntlet, so the connector and the wiring gets in the way of the gauntlet and trying to secure the gloves. The gauntlet has an extra section of material out the back. It was added apparently to hide the connectors, but it only serves to make a jumble of the wiring. It takes me way longer to get the wiring routed through the jacket, get everything buttoned up and then try to put on the gloves and get going than I’d like. 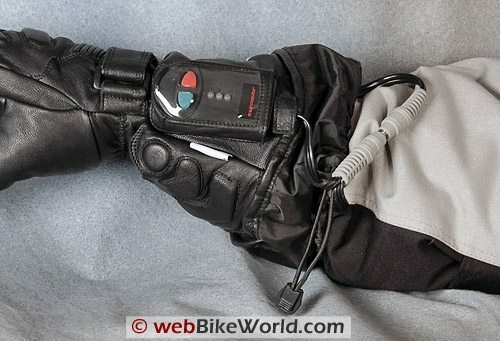 Since Tourmaster recommends that the Synergy garments are only turned on after the bike is started, this means I have to get all suited up, remember to button up my jacket, put in my earplugs, put on the helmet and do everything else, then put the gloves on last and sit on the bike, plug myself in and start it up. Which also means I now have to wait on the bike until it warms up. Normally, I’ll start the bike first thing and then make the final preparations and by time I’m ready, the bike is warm enough to go. The Synergy gloves don’t really have much else to offer, in my opinion. The quality seems rather low, the padding is minimal and although the lining is comfortable, the gloves make my hands sweat. The controller has to be placed in a small pocket on the right glove and a section of Velcro-backed leather is used to secure the controller to the glove. It just seems to me like the gloves weren’t designed with the same care as the Synergy vest. They seem more trouble than they’re worth, and since we can’t tell if they are putting out any heat, it’s hard to recommend them. My advice is to stick with the Synergy vest and hope that they upgrade the gloves in Version 2.0. As of this writing, the gloves are unavailable on the Tourmaster site, so I wonder if they had problems with them and are re-tooling. For information on current draw and other details, please refer to our Tourmaster Synergy Heated Vest Review. UPDATE: One more thing I forgot to mention… The thumbs on this pair of Synergy gloves are very short and out of proportion to the length of the fingers. My hands are normal male size large and I’ve never experienced this problem before (at least to this degree). My thumbs are jammed into the gloves, which causes discomfort within minutes of riding and actually makes it difficult to handle the controls on the bike. From “H.M.” (1/10): “I purchased a pair of the gloves in Dec 2009. I actually had the opposite problem as everyone else. I can’t get my gloves to turn off. Right out of the box they did not work. When I plug them in to the bike and turn the key to the on position the gloves immediately start to warm up. I do not press any control buttons and have even tried pushing the off button to make sure they are really off. Once the bike is started the gloves really start to warm up. Editor’s Reply: Sounds like a defective pair or possibly an incorrect installation? I wouldn’t condemn the entire product because of this, I’d suggest exchanging them and trying again. From “D.R.” (3/09): “I also bought a pair of these around (December) 2008. The size of the glove runs small from my normal size (men’s large) and make my hands uncomfortable within 15-20 min. I commute every day 25 miles one way and I like the heat. In the coldest temps here in Dallas (high 20’s-low 30’s), ‘high’ is needed but most of the time I will use ‘med’. My right thumb gets cold however because the heating wire stops at the knuckle. Yesterday the right glove wasn’t working but when I got to work and checked both gloves with an ohm meter they were the same. I plugged them back in and they worked fine. They also worked fine this morning. Can’t explain that one. From “HME @ NYC” (12/08): “I agree with most of the reviews here. I owned a pair of Tourmaster Synergy Gloves which I recently bought about 2 months ago for $125 USD. The thermostat kept shutting off and my thumb would sometimes freeze and they were very time-consuming to put on. Another thing that wasn’t mentioned here is that the controller is very hard to operate while riding as it is in a very awkward spot on the right glove. If I wanted to be safe I would have to pull over to change the setting. Otherwise I’d have to reach around the back of my right hand and do so; not safe on a street bike at least. They still kept me going in freezing temperatures and I put up with their shortcomings, but eventually the wiring harness/controller gave up (after 2 months) and my left glove died. I guess since they’re the cheapest out there I get what I paid for. From “E.M.” (11/08): “I have had the Synergy gloves only for a couple of months. My gloves are indeed bulky and feel like the fingers are a bit too long. I have other XL Cortech gloves that fit perfectly. Strange. These gloves are definitely not a good “stand alone” item to be used. I can’t imagine dealing with all the wires without the jacket liner. However if mated to the liner, I don’t find the gloves to be overly cumbersome. The only drawback is that you can’t separately control the heat if they are connected directly to the vest. From “K.J.C.”: “I purchased some Tourmaster Synergy gear last week (jacket + gloves) and have been using them on my morning commute (30 freeway miles, low 30s) and have no complaints. Like you said in your jacket review, the thing puts out unbelievable heat, and I found that having it on medium at 80mph is enough to keep me comfortable. Your glove review, though, was complaining that you couldn’t feel the gloves putting out any heat, and I’ve found that to be the case as well… however, my hands did definitely NOT get cold/numb like they used to. I tried using the gloves, unplugged, for some of my ride in this morning, and they got pretty cold pretty quick. I think this demonstrates that the gloves DO work. From “J.P.”: “I completely agree with everything you said. The gloves have not worked for me and the thermostat keeps shutting off. This is a brand new pair. I have emailed Tourmaster and still have received no response other than the automatic reply. I feel that Tourmaster is ignoring customer concerns to avoid a financial loss. This is selfish of them and I am sure they are aware of this by now. 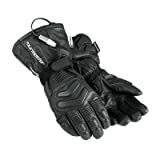 I have read forums and other on-line reviews and it seems like a great amount of Tourmaster’s synergy gloves have defective temperature control units. I tend to wonder how many defective pairs were sold. From “J.R.”: “I have to disagree with your conclusion on the Tourmaster Synergy Heated Gloves. My wife and I got each other a pair for Christmas and they are working wonderfully. Editor’s Reply: It’s possible we have a defective pair, but we haven’t received a response from Tourmaster.